Over at SWUS Online we not only have beautiful projects provided for you we have fun live challenges as well with a time limit attached to them. They are fast, mad and very, very FUN> So last week it was Zoe's turn to host a live chat and set a challenge for us all and I managed to have a play myself. Zoe set us a ketch and I pretty much followed it. Love the dryer sheet technique-yep glitter is always all over my basement! I love the Rusty Chocolate!! The felt flowers are a nice touch! These are lovely Monica, looks like you are having fun at Stamp with Us.................wish I had time to join in but just so busy at the mo.........still not had a go with my new pencils yet!!!! Beauitful projects Monica, you always sound like you have fun on SWU, I am going to have to join in next time. I love the colour combination of the rusty chocky one especially - you colour combinatinsn are always inspirational. Mmmmmm that rusty chocolate looks delicious Monica! Also loving the dazzling diamonds on your last creation - I can only imagine how long you were sparkling for after playing with it! I've been known to find it in my cuppa! LOL! Had so much fun on the chat and challenge the other night. I like your card much more than mine! 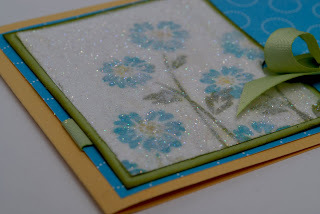 Love your cards Monica...they're really pretty! 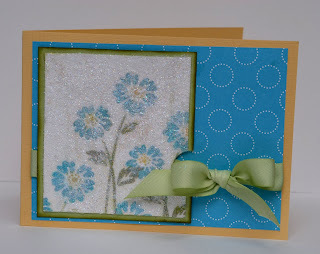 tBoth very beautiful cards Monica, I am enjoying all the fun at stamp with us!! What great cards you have there. You always knock them out the park when you create a new card. TFS! Oh two lovely cards Monica, love your rusty chocolate one, the colours are fab!